The Dizi (笛子) version of Moon over Mountain Pass (关山月,Guan Shan Yue) is here. 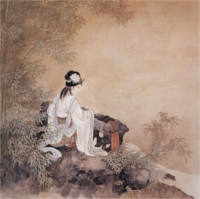 The origin of the Moon over Mountain Pass (关山月,Guan Shan Yue)dated back to Han Dynasty. It has become famous after the Poem of Li Po.